Savory star dip by Hungry Happenings – learn the trick to make the stars, and you can put ’em anywhere! Patriotic popsicles by HowDoesShe – the drip guards are “fireworks”! Fruit star cookies by Gold Medal – a classic sugar cookie that’s frosted and decorated with strawberries and blueberries. Yum! Patriotic peppermint patties by Mom On Timeout – these are really quick and easy to make, so it’s a good one to make with kids, or at the last minute. 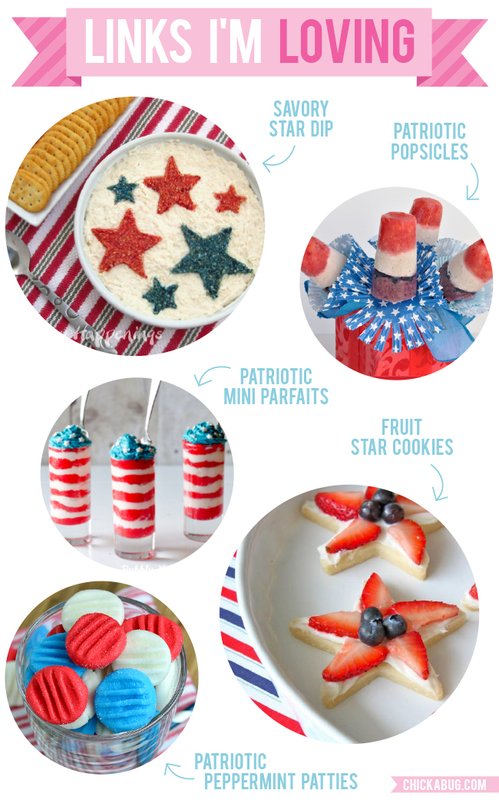 For more patriotic party ideas and recipes, click here! Shop for personalized 4th of July paper goods and printables here. Or, check out more Fourth of July ideas on Pinterest or here on my blog!